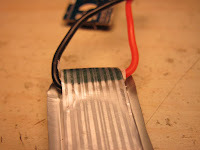 I have long been experimenting with various solar panels initially to try to make some devices more autonomous (eg: self-recharging hexapod robot, long-lasting outdoor camera, etc) and noticed that solar panels have become very cheap and that low quality batteries can also be reasonably cheap. I started to think "what if I used a lot of batteries to power some of my home appliances like servers, water heater, etc?". about 400W on average (light, PCs, water heating). In order to deliver 400W 24 hours a day with 8 hours of charging, I'd need to charge at 1200W and to store 9.6 kWh of energy. 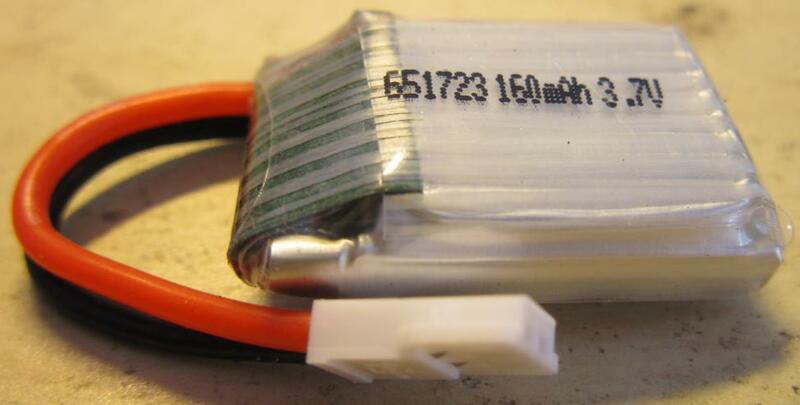 A correct LiPo cell stores 2.6Ah at 3.7V, or 9.6Wh. Thus I'd need 1000 such batteries just to store the required energy. At about $2-3 a battery it's not interesting. But I thought, why would I need batteries ? Two thirds of my consumption are during the day and one third at night. And these are differently priced so that the day is more expensive (15cts/kWh during day, 10cts at night). So by using 400W of direct solar energy I could expect to be able to cut the day consumption in half, resulting in a 37.5% overall saving on the daily bill. This approach sounds interesting because it uses 3 times less solar panels and no batteries. But how to power devices on irregular energy sources ? Then I started to think about some ZVS induction heaters I've made in the past, these ones are resonant self-oscillating circuits. Wouldn't it be possible to do this with mains ? 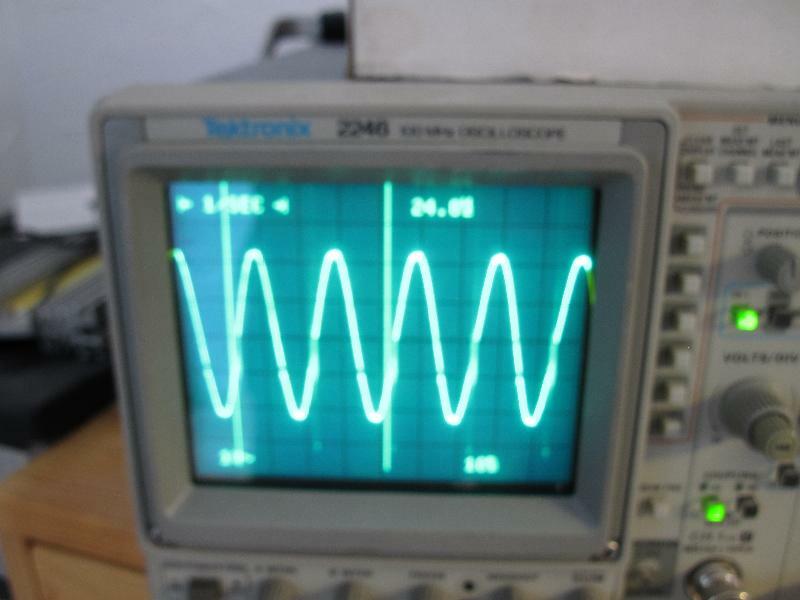 That is, monitor the mains voltage to decide what polarity to send into a transformer ? 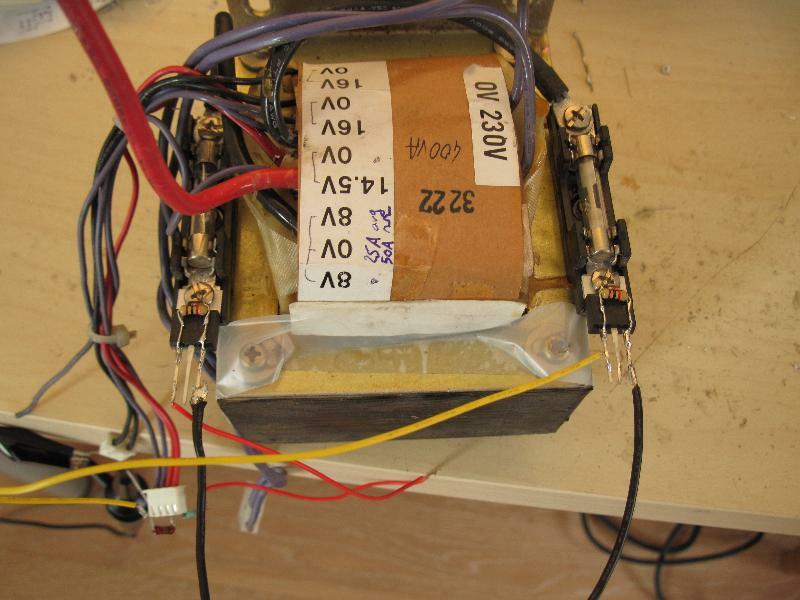 After all in order to monitor the mains, I just need another independant transformer that's not too much affected by the power I feed into the secondary coil. Thus I ran an experiment with two miniature transformers (12V/1.2VA each) installed behind a 12/230V DC/AC converter (I prefer to use this than real mains during experiments like this). Impressively this worked pretty well out of the box, I could cancel the power consumption of the primary transformer. 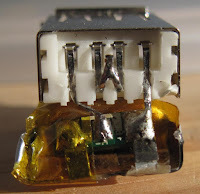 That immediately made me think about these old transformers I salvaged from a dead UPS, I remembered they had some additional windings. I took one of them, a 400VA model, measured the voltage across its terminals and found that it matched the markings : 8V symmetric on a 50A circuit (designed to take 12V peaks on its input to produce the 325V peaks), and 14.5V on a low power circuit. 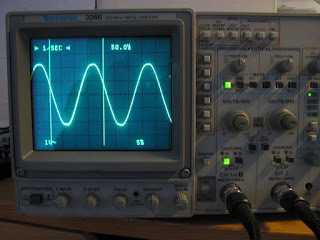 This last one would be used to monitor the mains polarity. As long as I don't feed too strong a current, mains will always win and impose its polarity, and this monitoring winding would force the mosfets to reverse the current. Note that some of these 19.9W are in fact injected into the mains, this explains why almost nothing heats here and why a higher current was needed to cancel consumption when connected to mains than to the DC/AC converter. Pushing the DC voltage higher results in the power meter showing a positive power again, indicating that I'm sending even more power into the house. At this point I stopped the experiment. 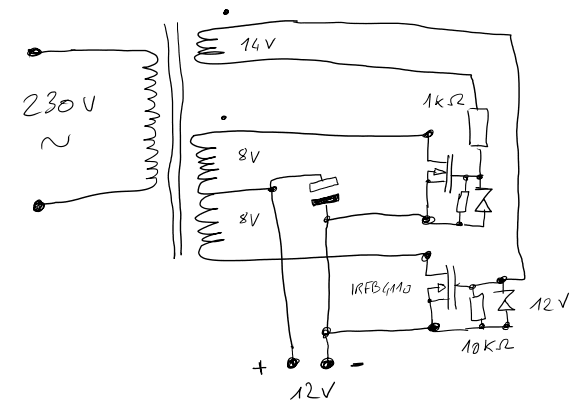 So yes, it is technically possible to re-inject some power into mains with a simple enough circuit. 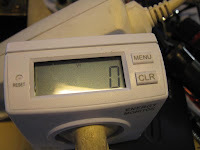 At this point one difficulty is to find the proper input DC voltage to cancel the mains without sending too much, because I don't want to dissipate too much power nor to send power back into the grid (with even the risk that it would make the disc spin again and charge me for the power I offer). Probably that producing only the minimum of any day's power usage would be a very simple way to solve this. 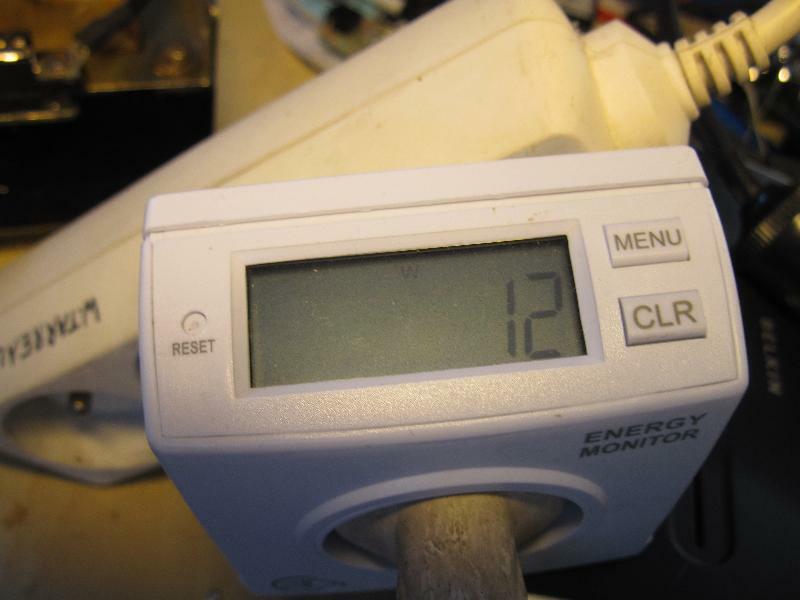 Otherwise maybe a current meter on the mains connection to the grid could make it possible to have some feedback and regulate the injected power. But these artefacts should be very easy to cancel using a small capacitor across the transformer's terminals connected to the MOSFETs and it will also increase the efficiency and limit the MOSFET heating. Note that during this experiment, the MOSFETs were barely warm. 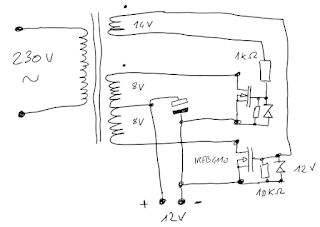 Another improvement could consist in using a voltage comparator to always saturate the MOSFETs during the switch but given that the voltage is low at this moment it's not even certain that this is needed. I should also possibly use a choke in series with the central point of the transformer to absorb current impulses during the polarity inversion. But all this is very cheap and just a matter of experimenting a little bit. Good solar panels having about 20% efficiency are found around $1/W nowadays, so for $400 it's possible to build a 400W array. Feeding 400W of power into the mains 8 hours a day every day at peak energy cost would save 175 EUR/yr, so the panels and circuits would be amoritzed in 2.5 years approximately. 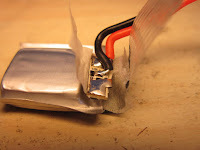 Note that I thought about charging batteries at night and re-injecting the power during the day, but the cost difference and the inevitable losses would not make this worth, and it would take decades to amortize the batteries cost. Has anyone successfully tried such a design ? Suggestions welcome. 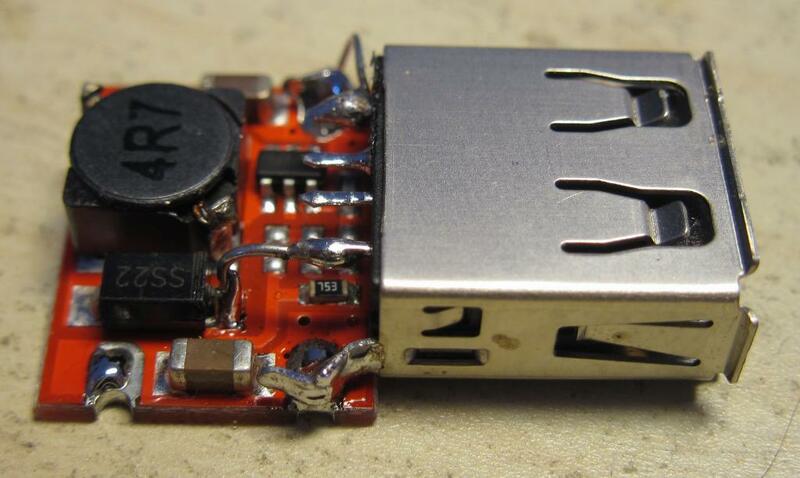 The success of USB as a power source is amazing. 15 years ago my friend Benoit Dolez told me "why not run a whole house on low voltage and avoid the risks of electric shock for everyone ?". I remember I responded "no, that wouldn't be practical, you'd need a very high amperage for this, it would require very thick cables and would cause too many losses". "Oh too bad" he said. Of course I was wrong. Not on the technical side of things. On the social one. 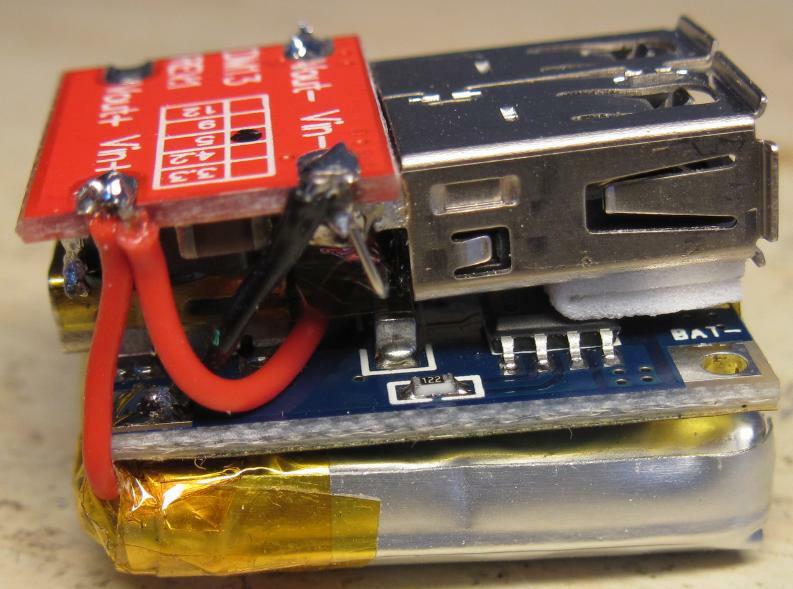 I didn't count on the possible success of portable devices making almost any device vendor provide a USB connector to receive some power. 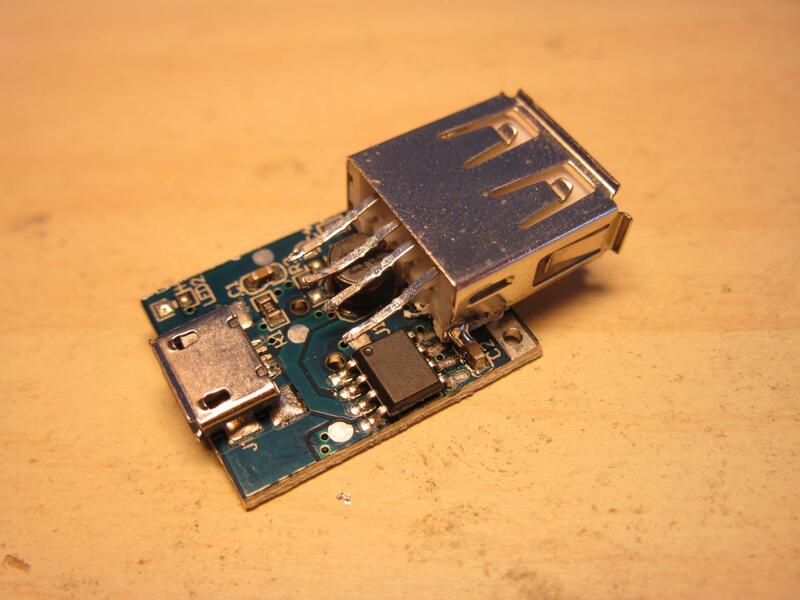 Some even just draw copper lanes imitating the USB connector on their PCB. And this success wouldn't have been that huge without all those fantastic smartphones who stopped competing on how long they last on battery, and instead compete on how large the screen is and how fast their CPU can process pixels, even if that only lasts a few minutes before having to be plugged to the mains again (no single smartphone lasts as long as our 20-years old so-called cordless phones which could run on Ni-MH batteries for 8 hours talking). All of this madness has resulted in the need for USB everywhere, instead of its usefulness. And when there is a need somewhere, there is a market, and there are innovations, products and progress. I remember saying around 2008 in a shop "hey look they've put a USB connector on this wall plug, that's neat!". Right now in 2016 people visiting you at home routinely ask "where is the closest USB plug?". "The closest?". Not only it became obvious you have one, but you're even supposed to have many, all easily accessible! And that's true, we see USB-equipped power plugs everywhere. We even see USB-only power plugs. 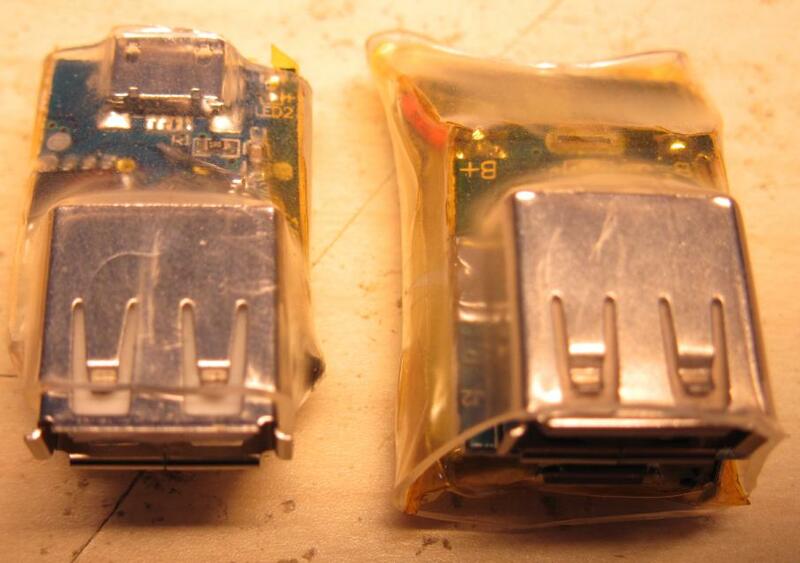 There are certainly more USB-equipped homes than WiFi equipped homes now. And that's what proves Benoit was right and I was wrong. 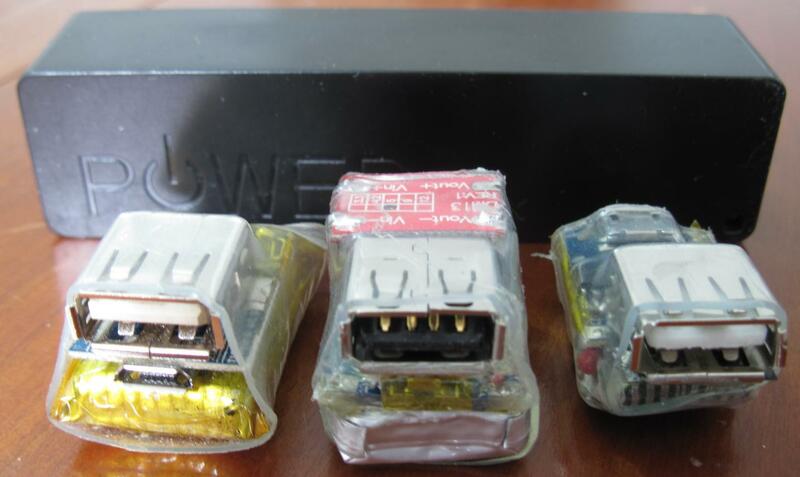 No need for thick wires, just put a power supply into each and every plug and you're done! I tried to count the number of USB connectors I have at home and it's not easy given that every simple appliance has at least one. Counting those able to deliver power immediately or by just pressing a button or putting them in a very close plug is more meaningful. That seems to be around 20-60 on average, there are already 54 around my desk under power right now due to the PC, power plugs and the build farm. These days, small 5V power supplies cost around $1 shipping included and are cheaper than the equivalent high gauge cable you'd need to connect to the central panel under 5V. 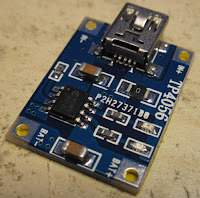 And a 6-10 port 60W USB power supply costs between $10 and $20. 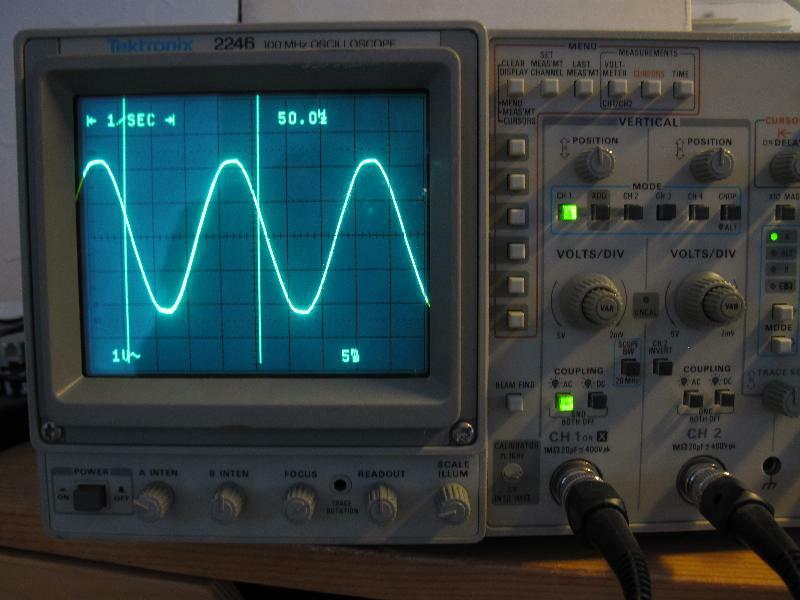 But there's an area where it's less convenient to have 5V. When you're moving. Then you find lithium batteries coming in 1, 2, 3 or 4 cells, selling milliamps-hours. And all are lying since they advertise the cumulated mAh at the battery voltage instead of 5V, but since everyone does it, the first one not to do it would lose. What matters are Watt-hours (Wh), a unit for energy, they are the product of the voltage and the capacity in amp-hours. 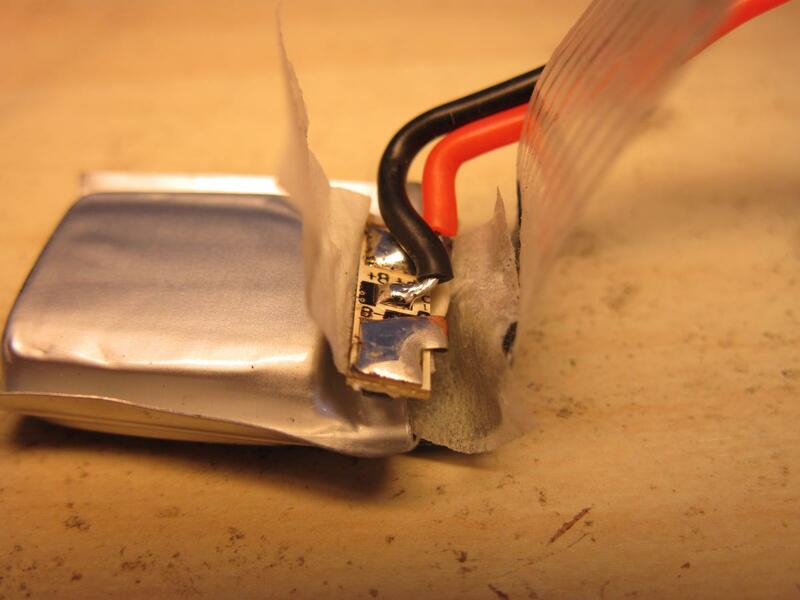 Batteries are thick and heavy (though lithium batteries are much lighter than lead or NiMH batteries). You tend to have as many as the places where you need them. I have one in my bag, another one with my laptop, another one in the room where I'm doing some hacking, another one with my bike serving for the front light (which is USB-based too, strangely). But with many batteries, you often have many nearly discharged batteries. Thus this idea : why not have a very small battery in the pocket like you have your keys or your USB stick ? After all, most often you don't need the full capacity of your battery, and if you need it it's never large enough and you'd have preferred a larger one. So let's ignore heavy usages and go back to the most common ones : lighting a portable torch for a few minutes in the garage, recharging your phone to pass an quick call, powering a small WiFi router to connect your phone to a local network, recharging a bluetooth speaker or your TV's remote, having some light on your bike to go back home at night, etc... We all know such usages. And we'd be fine with a very small battery that's constantly in our pocket. I decided to attack this idea with pretty good results. I ordered various small cheap batteries from a few Chinese vendors. 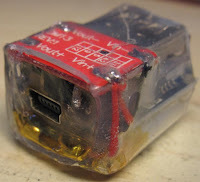 I picked some models made for small drones because these ones are very cheap and support high charge and discharge rates (up to 5C charge and 20C discharge). 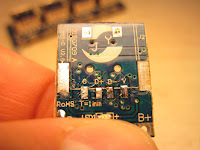 I bought various capacities and tried to pick models that would be resonably small compared to the power conversion module. I ordered 100, 160, 240, 300, 380, 500, 680 mAh. 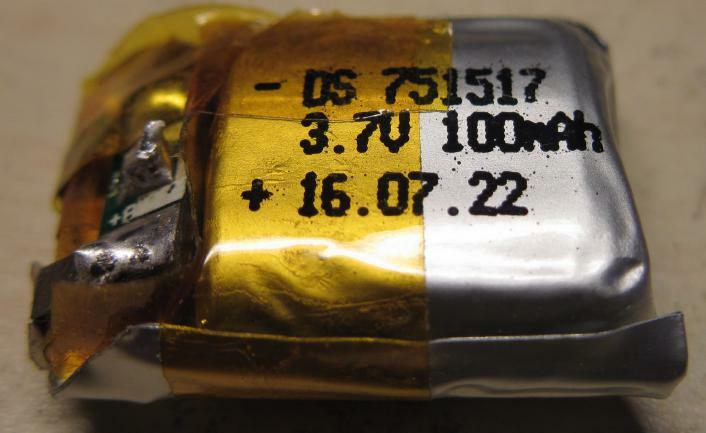 The reference on the batteries often have 6 digits such as "751517" on the 100mAh battery below. The first two digits correspond to the thickness in 1/10 millimeters. The 3rd and 4th one are the width in millimeters. The last two are the length in millimeters. This 100mAh battery is 7.5mm thick, 15mm wide and 17mm long. Yes that's tiny! 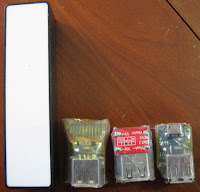 The devices looked great but there was a lot of wasted area, especially on the largest ones (300mAh and more). 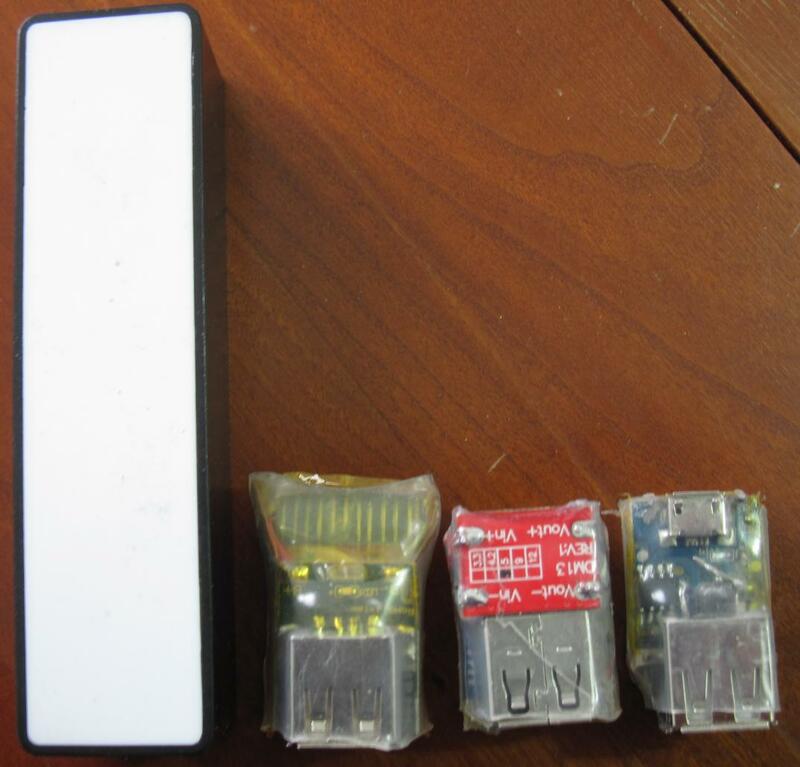 On both photos below, the left one is the 160mAh version and the large one is the 300mAh one. Also I noticed that the modules were unable to deliver more than 800 mA, and my bike's front light needs 1.3 to 1.6 amp peak. 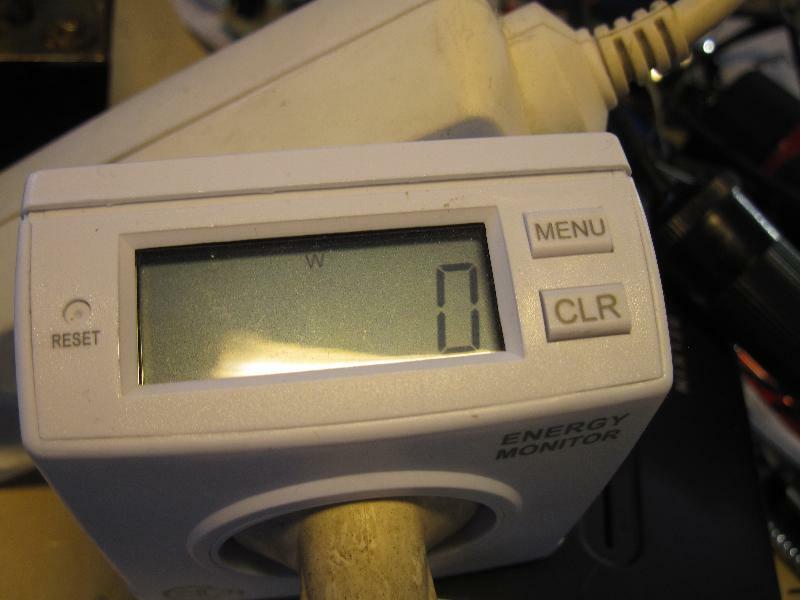 More importantly, it always starts at the highest level which means that if the converter is not strong enough and cuts off, it's impossible to reach the lower power level. My bike's front light liked it pretty much (a white led is 3.2V approximatively), however I found a few devices which couldn't run off it, often those which need to boost the voltage, because generally they employ low-Rdson MOSFETs which are not saturated below 4V which which leak a lot of power. 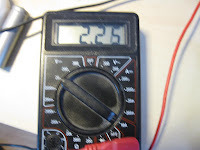 So I stopped the experimentation there, still frustrated that I didn't have the ultimate universal battery. 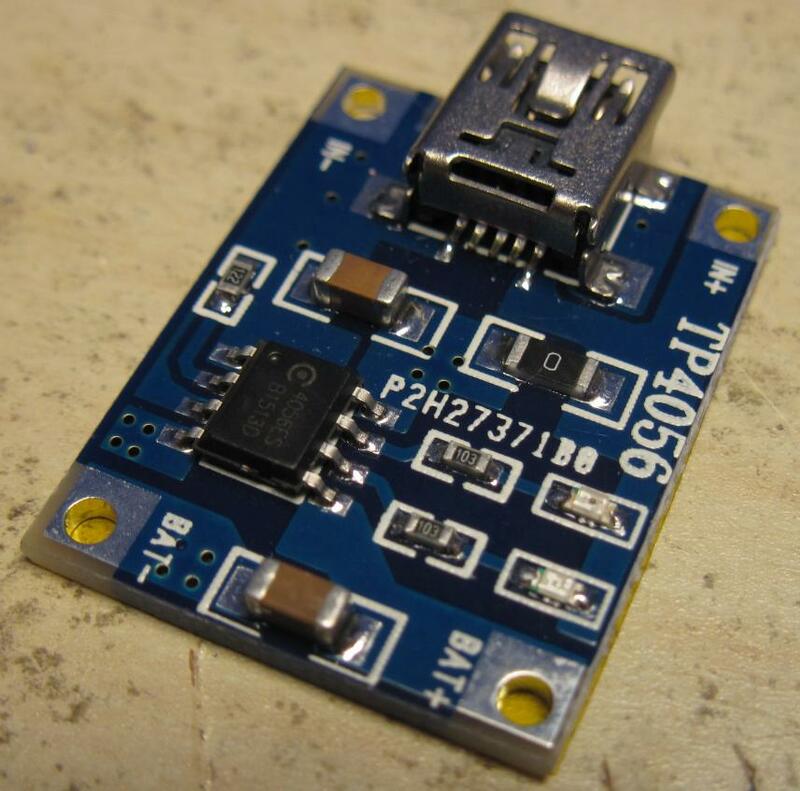 After searching I finally found another module, based on a TP5400 chip, which can deliver about 1.2 amps on 5V from a fresh battery. I ordered two (just in case I'd kill one). It's pretty well designed for my use case. Very little wasted space. 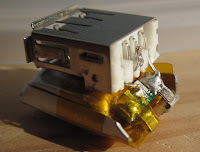 One side has only low-profile components and the micro-usb connector, the other side has the USB connector, the inductor and the integrated circuit. It is possible to solder the 100 mAh battery on the flat side so that it doesn't increase the module's width at all. 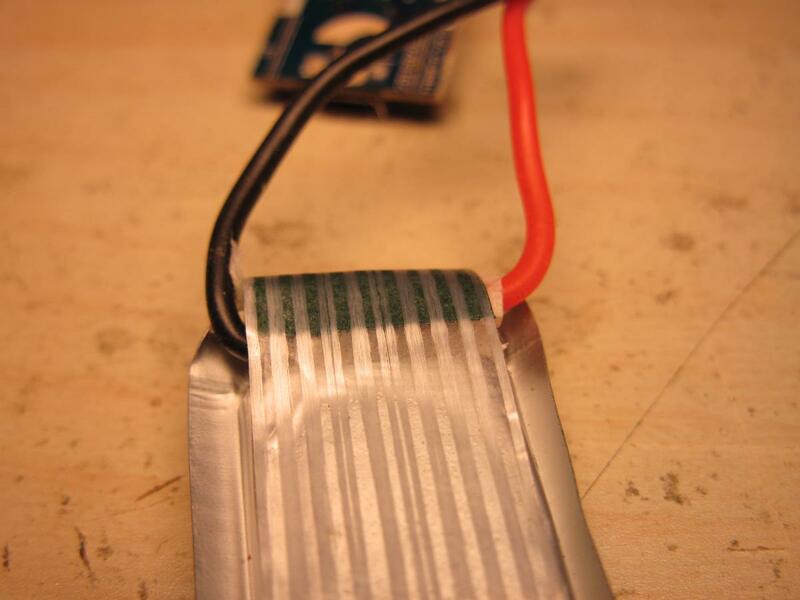 Since the battery is only 100 mAh, I changed the charging resistor from 1.2k to 3.3k to limit the charging current to about 330 mA (about 20 minutes). This device is capable of powering my bike's light, and even to power my Clearfog base ARM-based server via a USB-to-12V converter. 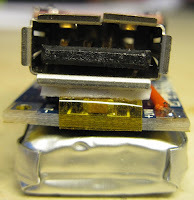 The module heats, but the device runs and works fine even with the Gigabit Ethernet cable plugged. Of course it will not last long, maybe 10 minutes only, at this rate. But sometimes it's useful. Just like my bike, at half light intensity (as I normally use it), it should last about 8 minutes. That's enough to cut through the woods at night when going back home... And I think I could put the 160 mAh battery there with a bit of effort. 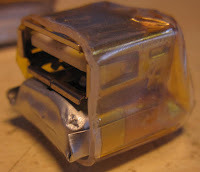 However, I noticed that my bike is pulling hard from this module, and if it had not been charged recently, it will cut off. After a few tests, it appears very powerful. 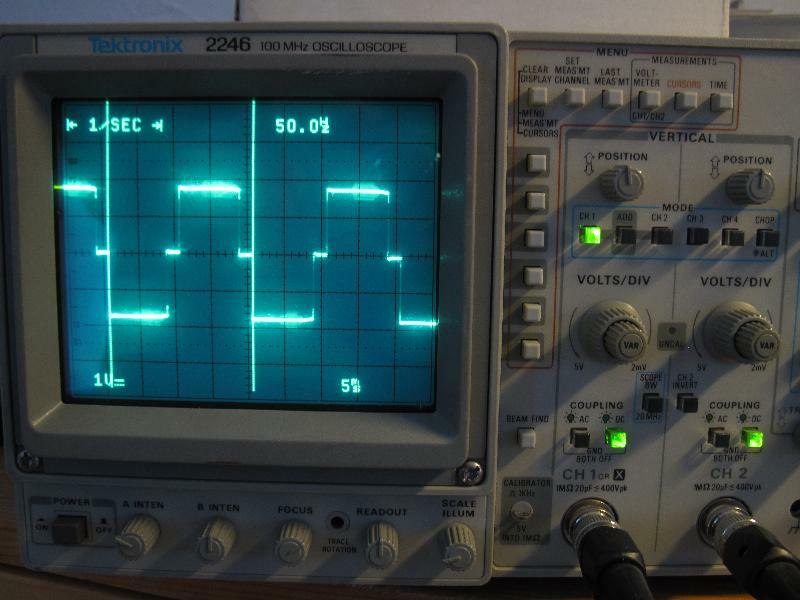 I could draw slightly more than 2 Amps from it, that's 10 Watts! In addition I forgot to reprogram the TP4056 for a lower charge current, so it charges under 1A (which the battery supports as it's supposed to support 5C hence 1.2A), and is fully loaded in 15-20 minutes. The power conversion module eats a bit of power even when idle. 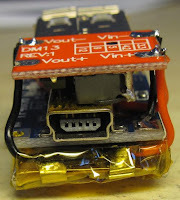 I measured around 100 microamps, meaning that the battery will be depleted after 3 months not being used. But given that I have it every day in my pocket now it's not a problem. And it has already served me many times since I've built it! I've used it to power some development boards while I had no more USB port available, and last night to have some light on my bike when the original 2.2Ah battery gave up mid-trip. I managed to get at least 15 minutes of light, I don't know if it will give more but that was enough. The purpose was perfectly filled since I had it available in my pocket as every day now. So what's the next step now ? I'm not interested at all in trying to create a business around this, but I'm pretty sure that many people would love to have a very small power reserve in their keychains. 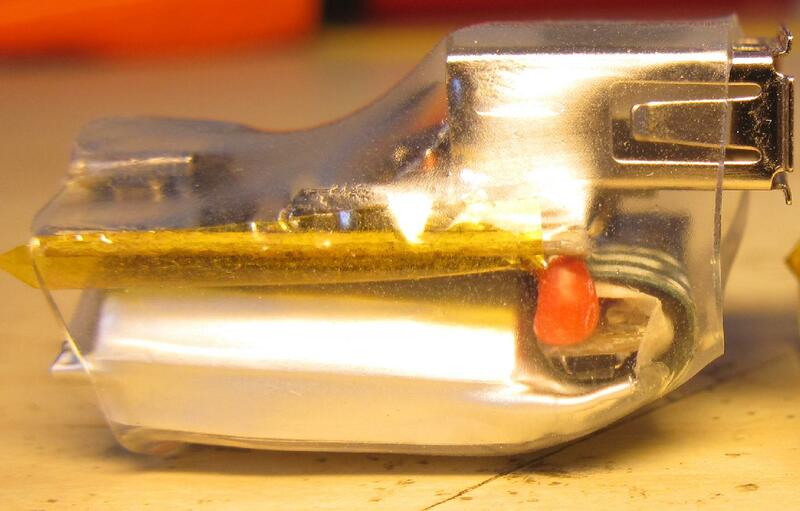 These devices are small enough to be arranged with the connectors inline opposed to each other and the battery in the middle. Just add a small keychain ring and you're done. I'd love it if one day I can buy a small keychain looking like this. 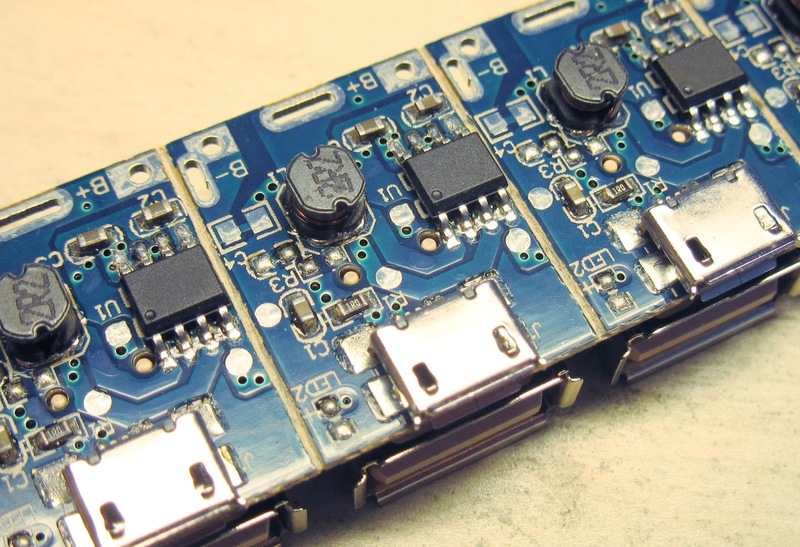 Let's hope all the makers of programmable door remotes and USB flash keychains copy this idea and allow us to bring 5V everywhere with us with real power (at least 2A). 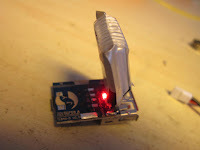 I thought about using the same micro-USB connector as an input and an output but it would cause a cable issue as micro-usb to micro-usb is very rare. 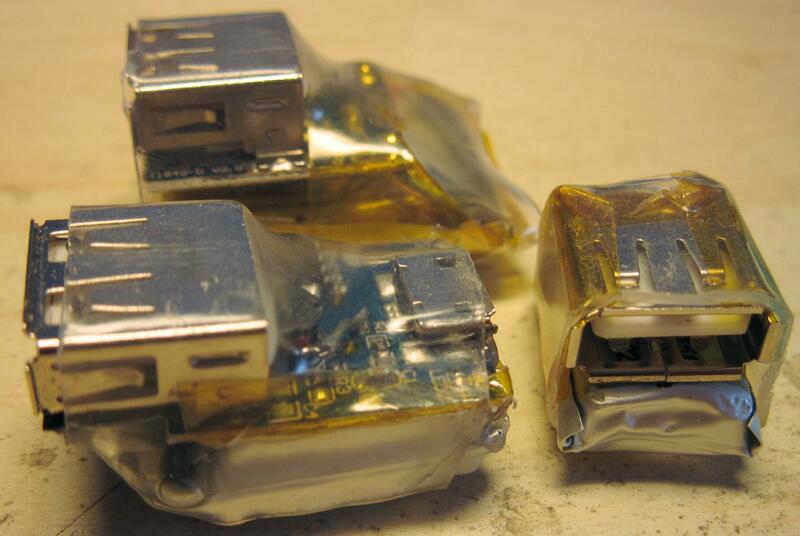 And using a male micro-usb connector would make it too fragile. 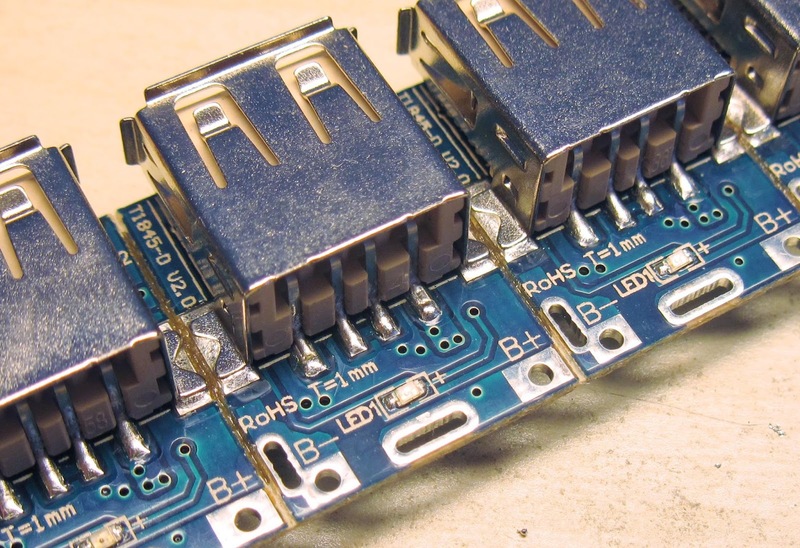 For the long term, it would be nice to see an evolution of the USB norm allowing certain categories of device to *officially* run from 3 to 5V. 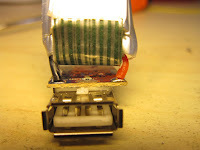 These ones would be advertised as "green power" or something like this because they don't require a conversion module which comes with losses, and would even smaller power blocks to be made (or with higher energy by converting the PCB space to battery space).